I am incredibly late in writing and publishing this post, and even though the day is over in less than an hour, I still feel compelled to write it! This week has been crowned Blog Positivity Week by Ashley at After Nine To Five. She had this great idea to celebrate all the reasons why being a part of the blogging community is awesome, and I love that! I may be new to this, but I've gained a lot in such a short amount of time. 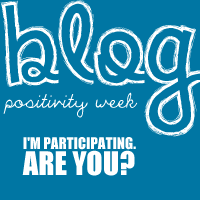 This week, I will be writing my posts with Blog Positivity Week (BPW) in mind. With each post, I'll share one reason why I love blogging. Today's post is about reflection and using my blog as a forum. I use my blog as a journal. I use it to reflect. Since I started blogging publicly seven weeks ago, I've also used my blog as a forum. I love getting e-mails and comments from all of you, and I feel like I'm constantly learning from you -- how you view the world, what you value in life, your responses to what I post. Today my BPW key words are reflection and forum. Remember how I mentioned that I had a heavy heart this past weekend? I usually take the weekends off and use that time as "real life" time. It's so easy for me to get caught up in blogs and Twitter during the week, and I like having the weekends away from that. But this weekend, my time away was very intentional. I care not to spark a debate or discuss the efficacy of the movement. What's been on my heart is that person I named at the end of the list, Jason. Jason had a breakdown last Thursday in the most public way possible. He cracked. He lost it. He acted out in a way that is so out of character. You're probably thinking, How would YOU know that, Lindsay? Fair question. I know, because I grew up with the Russell family. I'm not best friends with them, but I grew up in the theatre arts program that his parents founded in San Diego, my hometown. It was, and still is, an incredibly close community. The kind of "nothing's a secret in this place" close. So, yes. I know that this public episode was out of character for him. Again, I'm not here to express my opinion about The Invisible Children or Kony 2012, although I'd be more than happy to discuss it with you. (Shoot me an e-mail! I consider myself an open-minded person, and I'm interested to hear what others have to say.) I want to discuss humanity, human failing, compassion. I felt disappointed on Friday as I read article after article after article about Jason. "News" articles were publishing incorrect information about the incident. People quickly took it as truth. People mercilessly attacked him, attacked his cause, and even childishly resorted to name-calling: "child molester," "the wannabe white American Savior," "sooo gay," and "a money-hungry phony." I've had a breakdown, but I was lucky enough to be "another statistic", an invisible nobody who could recover peacefully. I can't imagine going through that and being the narrator of a video that was viewed 100 million times in two weeks. Yikes! Lucky me, huh? When you see someone fall, are you going to mock, ridicule, and call him names? Or can you muster an ounce of compassion and offer a helping hand, an encouraging word, or some room to heal? Be kind. Show compassion. Be humble. with class, tact, and respect. Thank you for letting me use my blog for reflection and as a forum tonight. I extend my heart and love to the Russell family. Brighter days will come! If you have something to share, respectfully, I'd love to read it by comment or e-mail. Very well written, Linz. Thanks for having the courage to blog about something so important. So refreshing to read this morning! I agree! Seems our society is quick to judge and revel in the negative instead of celebrating the positive. Thanks for having the courage to speak out as humility, respect, and compassion have seemed to become a thing of the past. I 100% agree with you. It's so easy to judge someone without getting all the facts, when we are all guilty on something too. Thanks for this post my dear, and I'm so happy that you started blogging! I love this, Lindsay :) I haven't watched the video, but I've heard all about it and Jason's breakdown. One thing I always have to remind myself is that we never know what personal battles that person is fighting. We never know what causes people to act the way they do. There is ALWAYS more going on than we see. I so agree with you about this! We don't know the whole story, and now is a time when people should be showing grace to him. Beautifully said, I will be sharing. We all need a reminder to be humble and to remember to not judge... for we will also be judged. Thank you for speaking your heart! I'm totally on board with everything that you said in this post. Where is compassion & grace?! They are such beautiful things that aren't put into action very much. Breaks my heart. Anyway - go you for being bold. I love this. I have all but ignored the KONY stuff (as awful as that sounds, I only have so much time), but I totally resonate with what you have to say about not judging people in their worst moments. About showing them kindness and compassion. I'm so lad to have found your blog! I COMPLETELY agree with you. I read an article about him yesterday and who can really blame him for cracking under pressure? I kept thinking about his poor family (don't get me wrong, I have sympathy for him too). But to have so much public attention and then to find out your husband/father had a mental breakdown in a very public way, I just think it would be a lot to handle. I found you through Emily's blog, and I'm so glad I did. I love what you said about being kind and humble. I think people becomes so mixed up in arguing their point or making sure their debate is strong, that they begin to care more about being right than simply being kind.